Answer: They tried it and it didn’t work. Answer: They cost a lot of money to mail. Answer: They are a real hassle to keep producing. Newsletters have been around since the 1980’s when professionals started to be able to market their practices. They were popular then because the Internet didn’t exist and the only way to market a practice was through the Postal Service or the Yellow Pages (if you don’t know what the Yellow Pages are you can find out about this extinct program on Wikipedia). They tried it and it didn’t work. If you mail out a boring newsletter that is only about feet feet feet then people won’t read it. Really who cares so much about feet that they can’t wait to get their podiatrist’s newsletter to get the breaking news about onychomycosis? If you send out a boring newsletter no one will read it and it will cost you a bundle. 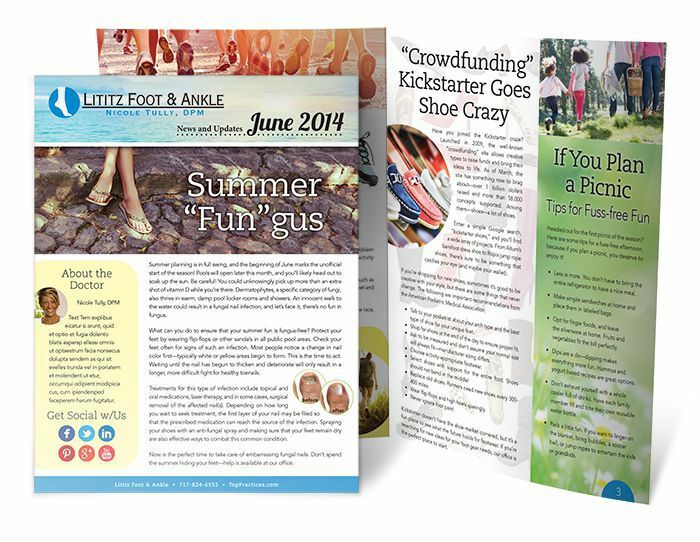 But if you send out an interesting newsletter that is about much more than feet, it actually can be something that people (especially women - our number one marketing target) will look forward to, read, and respond to. Newsletters work best when they are monthly. Quarterly won’t cut it; we won’t even produce a newsletter quarterly for our clients at Top Practices because they won’t get a response. But every month as a component of a great marketing plan – they just work. They cost a lot of money to print and mail. This is true if they don’t generate a response. But if they bring in new patients and reactivate existing patients AND generate referrals, it takes very little response to completely pay for these costs. I explain more about this on the Top Practices Website. Remember a well-done newsletter never ever costs you a penny. It generates high returns and income. The catch –you gotta do a good one. Like the ones we produce every month for our clients. They are a real hassle to keep producing. This is actually true. The months seem to come faster and faster. When I was a kid it seemed like time went so slow. Summer vacations seemed to be endless. Now it seems like I’m eating breakfast every 15 minutes! So yes, they are a total hassle to produce…unless you let Top Practices do it for you. We’ve got it down. We write them (interesting newsletters) and we design them, and we add your stuff to them, and we print them and we mail them and you… well you just check THAT essential marketing program off your list and send nice thank you emails to the Top Practices team from time to time thanking them for making this so doggone easy! There is a lot more information including the math that shows how this all works on the Top Practices Website. I encourage you to go there and see if this treasure of an idea, if this marketing strategy that the best marketers all use is for you. P.S. Contact us for more information about our newsletter program. Email us at [email protected] or call (717) 725-2679.